In 30 Teams, 30 Posts, I write a post (of varying amounts of seriousness) about every MLB team in some way in the lead-up to the beginning of the 2016 season. Earlier installments can be found here. Today, I speak of Dandy, the short-lived Yankees mascot. Every team in MLB has a mascot, with three exceptions: the Angels (although they do have the Rally Monkey), the Dodgers… and the Yankees. 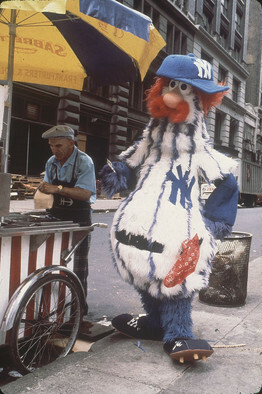 Created by Bonnie Erickson (who also designed Miss Piggy) and her husband and creative partner Wayde Harrison (together, they created the Phillie Phanatic, Youppi!, and other famed mascots), Dandy came to be in an attempt for the Yankees to replicate Phanatic Phever. With the Erickson/Harrison pedigree, a friendly and huggable shape, and a epic mustache, Dandy seemed destined for success. Even George Steinbrenner seemed interested in him, haggling with Erickson and Harrison to make sure that the color of Dandy’s pinstripes were the right shade. And Dandy may have gotten away with it too, if not for that meddling Chicken. Two weeks before Dandy was to debut in 1979, Lou Piniella took umbrage at the San Diego Chicken (on loan to the Mariners) putting a hex on Ron Guidry and threw his mitt at him. After this incident, Steinbrenner declared that mascots had no place in baseball. Still, a deal was a deal, so Dandy went into action- in a greatly reduced capacity. His opening debut, which would have involved a pre-set routine and theme music, was scrapped, never to be seen. The Yankees did everything in their power to make him as unimportant as possible, even saying in their team guide that he was just there to amuse the kiddies and stay as far away from the action as possible. True to their word, he was confined up in the cheap-seats. To make matters worse, for a time Dandy was banned from the stadium outright because his mustache called to mind Thurman Munson, who died in a tragic plane crash. So, perhaps it isn’t surprising that the few years that Dandy existed were ones of obscurity. As early as the 1990s, people who worked for the Yankees claimed that there never even was a mascot. At one point, during a rare public appearance, Dandy was attacked by a group of drunk bankers, causing the guy inside of the costume- somebody named Rick Ford- to hold it for ransom. Amazingly, though, it wasn’t the Yankees who cancelled Dandy. It was Erickson and Harrison, who hated how marginalized their creation was. They took him and went home when his lease was up, despite the fact the Yankees were interested in renewing it. To this day, they still own the rights and design, so if you are an eclectic millionaire looking to have a obscure mascot at your next birthday party… give them a call. This entry was posted in Baseball, MLB, Uncategorized and tagged 2016, 30 Posts, 30 Teams, 30 Teams 30 Posts, AL, baseball, Dandy, Major League Baseball, Mariners, mascot, MLB, New York, New York Yankees, NY Yankees, NYY, Yankees by danglickman. Bookmark the permalink. Hi, my name is Rick Ford, the original Dandy. I just read this article. I’m pleased that there is interest on the very first costumed mascot in Yankee history. There is a lot more to Dandy’s demise than what is written here. I have the full story. Is anybody out there interested? Hey Rick, if you want to, send me an e-mail (djgwriter@yahoo.com).